The following remarks were delivered on September 18 at the National Press Club in Washington, D.C. as part of the launch of Campaign Nonviolence’s week of actions. 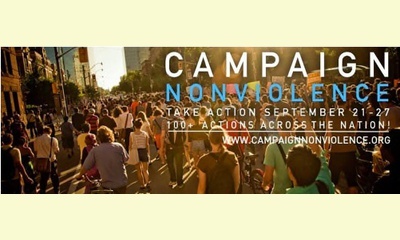 Today we are pleased to announce the launch of Campaign Nonviolence, a growing grassroots movement that begins this Sunday, September 21st, International Peace Day, with a week of over 225 protests, marches and rallies across the country in every state against war, military spending, poverty, the epidemic of violence and catastrophic climate change. I want to welcome my friends here, Ken Butigan, director of Campaign Nonviolence, Rev. Lennox Yearwood, of the HipHop Caucus who is on our board and who also works with 350.org, my friend Marie Dennis a long time peace activist with Pax Christi, and chair of Pax Christi International, and my friend Congressman Dennis Kucinich, a long time advocate for peace and justice. I thank Aric Caplan and Caplan Communications for helping us spread the word about Campaign Nonviolence. What we are doing this week is historic. As you know, change only happens from the bottom up, from grassroots movement building, from movements that grow and won’t go away. That’s what we learn from the Abolitionists, the Suffragists, the Labor movement, the Civil Rights movement and the anti-Vietnam war movement. This week, with Campaign Nonviolence, people across the country are coming together and, for the first time in decades, connecting the dots, making the links between the pressing issues of our time, taking to the streets in a groundswell of coalitions, demanding change on all fronts. With these 225 marches, rallies, and public events, thousands of ordinary Americans are speaking out in over 150 cities against war, and poverty and environmental destruction, and also calling for the visionary nonviolence of Dr. Martin Luther King, Jr. as a way forward for our country and the world, saying that we want a new culture of peace with justice, a new culture of nonviolence. As part of the Campaign Nonviolence, we published my book, “The Nonviolent Life,” and earlier this year, I toured the country for four months, and visited 35 cities where events will take place. I met with thousands of people who will be taking to the streets, and I heard for myself that people are fed up. They are sick and tired of this epidemic of violence, of our permanent war economy, of our ignoring catastrophic climate change, of poverty, and racism and killing, and serving the one percent and their oil companies and weapons manufacturers. So in Salt Lake City, they’re gathering to rally for nuclear disarmament and the use of those funds for environmental cleanup. In Sarasota, they’re marching for immigrants, low-wage workers, and an end to U.S. war-making. In Chicago and Wilmington, they’re marching against gun violence in our inner cities. In Bangor, Maine, they’re hosting an “End the Violence” rally.